ST. CROIX, USVI — A vehicular accident on Rattan Road late Friday night, February 8, 2019, left two men dead, emergency responders on the scene have confirmed. The incident, which occurred after the 11:00 p.m. hour, included a Jeep Wrangler and a 90s Ford Explorer. According to first responders, the Wrangler was heading east from west at a high rate of speed, hit the Ford Explorer and crashed into an old green tank, killing both driver and passenger. First responders, among them the United States Virgin Islands Fire Service, the USVIPD Emergency Medical Technicians and St. Croix Rescue worked together to remove the deceased from the Wrangler, whose bodies were transported to the morgue at the Juan F. Luis Hospital. The driver of the Explorer was unharmed. When The Consortium arrived on the scene, USVIPD Fire Service and St. Croix Rescue personnel were still on location, as they continued to investigate the incident in an attempt to determine how the accident occurred. 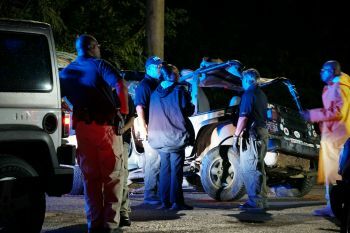 While the Ford Explorer sustained damage from the impact, it was the Jeep Wrangler that was mangled by the accident, as it crashed into an old green tank that had become a landmark of sorts for that area of the Rattan Road.